The great cholera epidemic in Russia, whose victims averaged over 3000 a week for a long period, brought to the front all the ignorance and superstition of the peasants. These poor people imagined that their relatives sent to the hospital were the victims of a murderous conspiracy by the medical authorities, and many hospitals were attacked and burned, and the stricken inmates released. 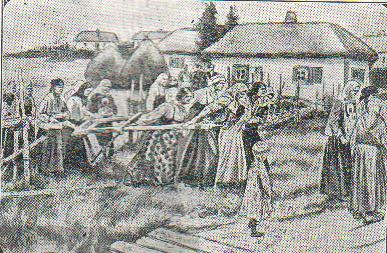 The peasants believe that the best way to keep away the cholera is to plough around the village, the plough having to be drawn by women and children, while the older women accompany the procession with ikons and holy water. The drawing on this page was made in the province of Ekaterinoslav, where the cholera carried off thousands of people, and is reprinted from the "Graphic." "Contrary to conventional wisdom, it would appear that the ability of the body to defend itself against melanoma depends upon sufficient exposure to natural sunlight, and that our ever increasing exposure to artificial light may have more to do with the incidence of melanoma than has been supposed." Such a claim could be dangerous stuff if followed since, scientifically speaking, the reverse is the case. A heading in Reader's Digest (1990 November) said: “Suntans Can Kill You". The article summarised medical conclusions concerning skin cancer, premature aging, eye damage and "crippled immune system". The message of science is that you should protect yourself with SPF15 sunscreens, shade, and clothing as appropriate. Non-scientific/unsubstantiated medical advice is nothing new. Throughout history the reliance on quackery and nonsense rather than science is more of a rule rather than the exception. Let's take a brief look. "I do not believe that the 'Sacred Disease' is any more divine or sacred than any other disease but, on the contrary, has specific characteristics and a definite cause." However, Hippocrates believed that the primary cause of disease was disharmony in the "four humours" or liquids of the body – blood, phlegm, yellow bile and black bile. He also considered that astrology could help with diagnosis. In ancient Egypt doctors had to follow the sacred medical writings attributed to Thoth the medical god. If the writings were followed and the patient died the doctor was not blamed. Second-century Christians often believed that God's Spirit gave the power to heal and not medical studies. Christian students of Galen (130-201 AD), the famous Greek physician, were excommunicated for studying "pagan medicine". This attitude had a revival in the Herbert Armstrong (1892-1986) cult of the 20th century! During the plagues of the Middle Ages people often crowded into churches and prayed to God to halt the disaster. Crowding, we now know, would have spread the infection! On one occasion the Lord Mayor of London blamed an epidemic on cats and dogs and started a campaign to destroy them. We now know that the real plague carriers were fleas which lived on rats. With less dogs and cats to kill the rats the plague spread! "Daily experience satisfies us that blood-letting has a most salutory effect in many diseases." Doubtless many people survived both their blood-letting and the illness which led them to try it. However, they survived because they were particularly robust. Removal of blood puts added stress on the body and was therefore a murderous form of treatment! The 19th century fad of Phrenology comes closer to psychology than medicine. Phrenologists analysed character and brain function from bumps on the skull. It was a pseudoscience – now discarded. SYDNEY: Celery growers and marketers have landed in the soup over claims the vegetable can prevent cancer and a long list of other diseases. Velvet – A smoke that “helps” in every sport! CIGARS DE JOY Give Immediate Relief In Cases of Asthma, Cough, Bronchitis, Hay-Fever, Influenza, & Shortness of Breath. Quack medicines and fantastic claims for certain foods abound in the 19th and 20th centuries. "Poor Man's Friend" was an ointment sold in white earthenware pots. It was a miracle cure for headache, bruises, gout, etc. The main ingredients were lard and sulphur. "Cut a chicken, or cat or any other live animal open, and take half and apply to the spot. In half an hour apply the other half to the place. Give all the whisky that can go into the body: three pints or more. Then after the poison has passed off, drink an ounce of sweet oil every day for six days." Linus Pauling (b. 1901) advocated vitamin C for keeping cancer, colds and other diseases at bay. Pauling now has prostate cancer but reasoned: "It may be that my vitamin C put the cancer off 20 years." Most experts think the theory unproven. A study of 11,348 adults aged 25-74 from 1971 to 1984 by James Enstrom, however, seemingly showed that 300mg - 400mg daily of vitamin C may extend life by six years by lowering the chances of heart disease and cancer. Lung trouble, acute or chronic, is cured by taking Scott’s Emulsion. Scott's Emulsion permanently cures lung trouble. CAPILLARINE will give you a strong, healthy moustache – mostly it's so effective it seems to make the hair fairly creep out of the upper lip – in every case it is successful – has been so for 30 years. General Grant and Emperor William were eminent men whose deaths were caused by Tobacco. Cancers started by the use of cigars being the cause of death in both instances. Tobacco Specific is a harmless remedy that will make the user of tobacco in any form quit the habit for good. It destroys the craving for the weed and aids nature in entirely eliminating the nicotine poison from the system. You are no different to the thousands of others who were once as thin and flat-chested as you are, but who, anxious to improve their condition, sent for a FREE TRIAL SAMPLE OF "FLESH-FOOD," and now possess fully-developed, well-rounded bosoms, of which they are justly proud. Let us…show you how to develop your figure, improve your health and increase your weight to normal. M. Knap, Paris Chemist, Will Give Discovery To World When It Deserves It. The Fountain of Youth has shifted from a mythical spring in Florida to an office at 22 rue Taitbout, Paris. But there, hidden behind dusty retorts and moulding skeletons, M. Georgia Knap, the discoverer, refuses to reveal his secret or to permit the world to drink of the waters of perpetual youth. "I won’t tell you what it is, my secret," said M. Knap. "But you can see the results for yourself. I have discovered a way of keeping myself young. I am sixty years old and I am younger than you at thirty. My secret is a mixture of auto-suggestion, modes of living, diet and exercise, all made potent by the Elixir of Life which I have discovered. When the world gets ready for the discovery I shall give it out free. It doesn't matter whether it takes twenty years or fifty, for I will still be alive." For centuries men – and women also, unfortunately – have been sorely afflicted with varicose veins in the legs, and, until the last few years, the only means of affording even temporary, if painful, relief has been the surgeon’s knife. Now all is changed, the old methods give way to the new, and The Vecsey Method of Treatment by external application only, painlessly and rapidly cures even the worst cases without laying up or detention from business, and makes but little demand upon your time – only a few minutes daily. WOMEN SUFFER MORE THAN MEN! Corpulence and Obesity inflict more hardship on women than on men. Excess fat takes away a woman’s loveliness – gives her an ugly, ungainly appearance, impedes her gait, interferes with her maternal instinct, injures her general health and makes life a burden, rather than a pleasure. "Fatcure" by removing the excess fat, removes all these unpleasant conditions. It is certain and reliable, non-poisonous and harmless. The fat, once reduced, does not return. "Fatcure" is always dependable and gives absolute satisfaction. It is the only safe and harmless treatment for obesity. Cancer troubles are becoming more numerous. We know of no remedy for internal cancers except surgery. Even then a cure is doubtful. We have recently learned of a very effective and simple remedy for cancers which show themselves on the surface of the body. We are informed that a physician, after testing this remedy, paid $1,000 for the information, and that he has established a Cancer Hospital which is doing good work. The recipe has come to us free and we are willing to communicate the formula, but to those only who are troubled with surface cancers and who will write to us directly, stating particulars. No fee will be charged, but in order to protect the sufferers, we require a promise that they will not sell the formula to others, nor receive pay for the use of it, nor communicate the formula to anybody. Anyone known to be a sufferer can be informed of the terms on which the prescription is obtainable through us. The "£100 REWARD" ad appeared in Pall Mall Gazette of 1891 November 13. A Mrs Carlill used the “Smoke Ball" as directed and caught influenza, which it supposedly protected against. She took the Company to court and won and collected the £100! Over-the-counter products which allegedly restore hair-loss are misleading and are now banned. Some former alleged hair-growth promoters are now sold as "tonics". To relate tobacco to sport and thus imply that smoking is good for you is becoming illegal. The Marlboro man, Wayne McLaren, died of lung cancer. The reproduced ad which says "Tobacco Kills" (in 1910!) must have been a lucky guess since science didn't support it until about 1940. Some tobacco companies denied the evidence a further fifty years – but that's because they found it profitable to help people get sick and die. In 1981 studies by Professor Trichopoulos of the University of Athens showed that even passive smoking (inhaling smoke which smokers have exhaled) can cause lung cancer. The "FLESH-FOOD" and "Fatcure" ads balance each other nicely since if you overdo one then you can remedy it with the other! Even nowadays only about 2% of overweight people who respond to weight-loss ads keep it off permanently. There are tablets now which suppress appetite, but nothing yet which: "would burn up my horrible mass of unwanted fat." The "Fountain of Youth" has been sought for centuries. According to the Bible death is the "last enemy" and will be conquered when Jesus returns. (1 Corinthians 15; Romans 5:12-14) In this instance the Bible so far is unrefuted. Will genetic engineering succeed where foods and fountains have failed? Some people claim that Noah and Methuselah lived long life spans because a water canopy in the sky screened out cosmic rays. Such a canopy has never been confirmed by science. Potentially, however, we could test the idea by comparing the longevity of submarine crews and crews of surface ships. 3 Sclerotherapy when chemicals are injected which glue the walls together. And just for the record: Massage does not break up fatty tissue; eating of carrots does not improve eyesight; an apple a day does not keep the doctor away; sexual fondling does not cause breast cancer; mosquito bites are not known to transmit AIDS; going barefoot does not cure colds; and stimulating the ear with acupuncture does not suppress appetite – an ear infection is more likely. "Avoid 'miracle cures' – there aren't any. Beware of 'wonder diets'." In 1832 a group of British physicians formed the Provincial Medical and Surgical Association to promote respect for medical science. In 1855 it was renamed British Medical Association. In 1900 about 18,000 medical practitioners were members. The Provincial Medical and Surgical Journal of 1840 became the British Medical Journal in 1857. The Association has long struggled to outlaw quackery in medicine, stop charlatans attending the sick, and expose worthless medicines. It opposed homeopaths, mesmerists and sellers of "secret" remedies. "perfect digestion, strong nerves, sound lungs, healthy liver, refreshing sleep, functional regularity, and energy to the most disordered or enfeebled, removing speedily and effectually indigestion (dyspepsia), habitual constipation, diarrhoea, haemorrhoids, liver complaints, flatulancy, nervousness, biliousness, fevers, sore throats, catarrhs, colds, influenza, noises in the head and ears, rheumatism, gout, impurities, eruptions, hysteria, neuralgia, irritability, sleeplessness, acidity, palpitation, heartburn, headache, debility, dropsy, cramps spasms, nausea and sickness, sinking fits, coughs, asthma, bronchitis, incipient consumption, scrofula, tightness of the chest... "
In 1880 the production of patent medicines supported about 19,000 employees. Payment of government stamp duty gave such medicines a bogus respectability. Starting in 1904 the British Medical Journal reported on alleged cures for baldness, catarrh, colds, deafness, diabetes, eczema, gout, kidney problems, obesity, piles, rheumatism, neuralgia, etc. In many cases alleged "medicines" with a penny's worth of ingredients such as soap and ginger were selling for twenty or more times their production costs. In 1908 the British Medical Association published the book Secret Remedies What they Cost and what they Contain. In 1911 the Association got the wording of the government stamp altered to read in large letters "No Government Guarantee". "many secret remedies making grossly exaggerated claims of efficacy; causing injury by leading sick persons to delay in securing medical treatment; containing in disguise large proportions of alcohol; professing to cure diseases incurable by medication; or essentially and deliberately fraudulent." Through all this the patent medicine industry of Britain kept flourishing with sales in 1936 of £15 million and ads costing £2 1/2 million. Prescribing excessive numbers of tablets may be a modern form of medical quackery. In a two-year period this person received two buckets-full more than she swallowed. Quackery in medicine is still with us and includes regular attempts to resurrect dubious remedies and claims. The British Medical Association sought a divide between qualified practitioners guided by scientific findings and incompetents seeking quick profits. Yet, one could argue that established medicine killed more people than the quacks! Quack remedies rarely killed or directly harmed. Indeed they often provided reassurance which itself may be conducive to healing. Scientifically tested medicines, however, provide not only reassurance but non psychological physiological benefits as well. Quackery would, unless suppressed, continue on and on because of the financial rewards to the quacks. Medical science in contrast is self-correcting so that even profitable treatments get withdrawn when newer research shows them to be useless or harmful.